Three months of Bible readings to help you investigate Mark's Gospel, Joshua and Paul's letter to the Ephesians. 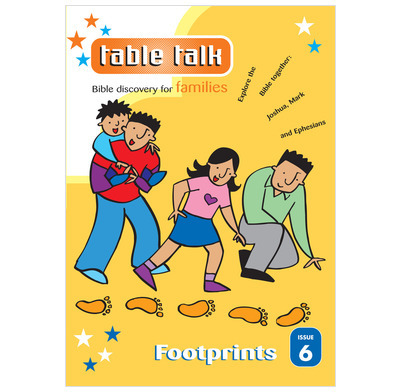 Issue Six of Table Talk is called Footprints. It contains three months of Bible readings to help you investigate who Jesus is and why He came in Mark's Gospel, explore the promised land with the Israelites in Joshua, and unravel the end of Paul's letter to the Ephesians. We use table talk with our 4 and 1 year old as our daily Bible reading. Some days work better than others depending on many things. Often we don't use the game/craft illustration at the beginning as this has proved too much of a distraction when we get to the main reading. Very helpful book. It presents the Gospel in the most simplest form which makes it exciting not only for children to read their Bibles but for adults as well. I wouldn't hesitate to recommend it to family and friends.